Americans spend more than $7 billion per year on heartburn drugs known as acid blockers or proton pump inhibitors (PPIs) and over $4 billion per year on over-the-counter antacids. PPIs are acid-blocking drugs that reduce the amount of stomach acid made by glands in the lining of your stomach. They have serious side effects, including parasitically leeching the vital mineral magnesium out of the body. The heartburn “cure,” in this case, is no better than the disease. Yet the roiling and burning in the gut from sugary junk food and greasy fast food is being incorrectly blamed on too much stomach acid. In many cases, heartburn is due to sugar fermentation in the stomach and a backflow of pancreatic enzymes from the small intestine. By neutralizing normal stomach acids, acid blockers/antacids make it impossible for us to digest our food properly or absorb vital nutrients and minerals from undigested food. Most people blame too much stomach acid as the cause of indigestion when in fact stomach acid is natural and necessary for health. Stomach acid is indispensable for proper digestion as well as a healthy immune response. Blocking stomach acid for long periods can lead to many serious health issues. When stomach acid is low, many essential nutrients cannot be absorbed, including amino acids, vitamins and essential minerals such as magnesium, iron, calcium and zinc. Acid blockers such as Nexium, which has recently received approval for a nonprescription over-the-counter version called Nexium® 24HR (esomeprazole 20 mg), have the following stated safety warnings and serious side effects according to their officially published literature. 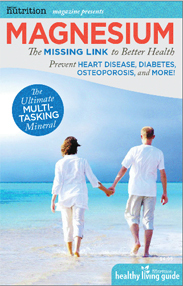 Low magnesium levels in your body. This problem can be serious. Low magnesium can happen in some people who take a proton pump inhibitor medicine for at least three months. You may or may not have symptoms of low magnesium. Seizures, dizziness, abnormal or fast heartbeat, jitteriness, jerking movements or shaking (tremors), muscle weakness, spasms of the hands and feet, cramps or muscle aches, or spasm of the voice box (most of which are symptoms of magnesium deficiency). Headache, diarrhea, nausea, gas, abdominal pain, constipation, dry mouth and drowsiness. Nexium increases your risk of getting severe diarrhea. This diarrhea is caused by an infection (Clostridium difficile) in your intestines. Call your doctor right away if you have watery stool, stomach pain, and fever that does not go away. Bone fractures. People who take multiple daily doses of proton pump inhibitor medicines for a long period of time (a year or longer) have an increased risk of fractures of the hip, wrist or spine. One study reviewed 130,487 postmenopausal participants in the federally funded Women’s Health Initiative and found that those taking PPIs had a 25 percent increase in the risk of fractures over about an eight-year period. Other research suggests PPI medications increase the risk of an intestinal bacterial infection called Clostridium difficile, or C. diff. This study, led by Michael D. Howell of Beth Israel Deaconess Medical Center and Harvard Medical School in Boston, involved about 102,000 hospital discharges from one medical center during a five-year period. It found that the greater the stomach acid reduction in a patient, the higher the risk of developing C. diff infection, which can cause severe diarrhea. Patients taking acid blockers daily had a 74 percent increased risk compared with those not taking the drugs. Patients taking more than a once-a-day acid blocker dose doubled their risk of getting C. diff. It’s also important to understand the grave effects low stomach acid and low magnesium have on calcium absorption. Calcium cannot dissolve in water and is entirely dependent on stomach acid to put it into solution. However, when it leaves the stomach’s highly acidic environment it enters the alkaline environment of the small intestine and precipitates out of solution unless sufficient magnesium is present. Without magnesium to keep it in solution, calcium quickly deposits in soft tissues throughout the body. In the large intestine, calcium interferes with peristalsis (the waves of muscle contractions that push food through the bowels), which results in constipation. When calcium in the bloodstream is filtered through the kidneys, it can combine with phosphorous or oxalic acid to form kidney stones. Calcium can deposit in the bladder lining, stiffening it and preventing it from fully relaxing. A rigid bladder will not be able to fill properly with urine, leading to frequent urination and leaking, especially in older people. Calcium can deposit in the lining of arteries, coating and stiffening cholesterol deposits (plaque), causing hardening of the arteries (arteriosclerosis). This, in turn, can cause high blood pressure as well as increase the risk of heart attack and stroke. Calcium can even deposit in the brain. Many researchers are investigating it as a possible cause of dementia, Alzheimer’s and Parkinson’s disease. Excess calcium can deposit in the breast, leading to breast tissue calcifications that can be erroneously thought to be a cancerous or precancerous condition. Gallstones can be a result of too much calcium and not enough magnesium in the body. Calcium can deposit in the lining of the bronchial tubes and cause asthma symptoms. Calcium in the extracellular fluid can surround cells in body tissue (organs, muscles) and decrease the permeability of the cell membranes. This makes it increasingly difficult for glucose (a very large molecule) to pass through the cell membrane to be converted into ATP (adenosine triphosphate) in the cell’s mitochondria. High glucose levels, because glucose can’t get into cells, is misdiagnosed as diabetes. Of note is that magnesium is necessary for seven of the ten steps in ATP production. Magnesium also helps open up the cells to glucose by helping to keep calcium in solution. With all of these health consequences in mind, if you must take PPIs, I highly recommend supplementing with a high-quality, highly absorbable form of magnesium on a daily basis. Take magnesium from four to six hours after taking your heartburn drug to minimize your risk of magnesium loss.